Anyone know what these tomato bumps are? 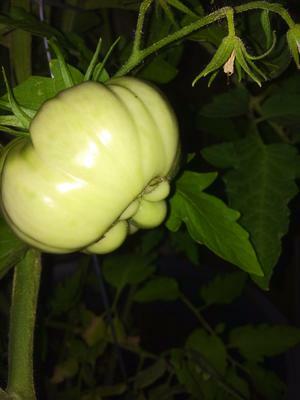 I have this tomato plant which is huge and just has this one tomato on it so far. It's growing strange. Can anyone tell me what the strange bumps are? Comments for Anyone know what these tomato bumps are? I think it's catfacing. It can be caused by insects, but usually caused by poor pollination. I guess it doesn't affect the taste of the tomato.